NASHVILLE, Tenn. – George J. Graham, a noted political theorist who was passionate about teaching and cared deeply for his students, died on Nov. 30 after a battle with lung cancer. Graham, 68, was a member of the Vanderbilt faculty for more than 40 years. He served as associate dean in the College of Arts and Science 1986-1988 and 1997-2000. The former chair of the Department of Political Science taught courses on Marxism and political philosophy this semester, despite undergoing extensive cancer treatments throughout the fall. Graham was born in Dayton, Ohio, and earned his bachelor‘s degree from Wabash College. He received a doctorate in government from Indiana University in 1965. His honors included a John Simon Guggenheim Memorial Fellowship and the Jeffrey Nordhaus Award for Excellence in Undergraduate Teaching in the College of Arts and Science. He was also awarded a fellowship at The National Humanities Institute at Yale University. 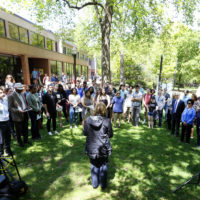 Graham designed an interdisciplinary master‘s degree and seminar, funded by the Mellon Foundation, which focused on social thought and drew professors from a variety of departments within the college. During his second term as associate dean, Graham established a formal internship program for students in Arts and Science to enable them to receive academic credit. Graham received a Fulbright grant in 1995 to hold the John Marshall Chair in Political Science at the Budapest University of Economic Sciences in Hungary. He led graduate-level courses on democratization and American institutions and said that he was pleased to have the opportunity to work with colleagues there at a time of transformation of democratic institutions. 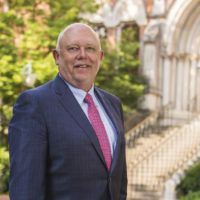 James Booth, professor of political science and philosophy, said that Graham helped recruit him to Vanderbilt in 1996. Booth remembers a constant stream of students coming to Graham‘s office for guidance. “Graham loved Vanderbilt, and this was the only place he wanted to teach,” Booth said. Graham helped establish the Foundations of Political Theory Section of the American Political Science Association, which he viewed as one of his academic legacies, according to Booth. Graham is also remembered as an avid photographer and gourmet cook who loved to travel abroad. Graham is survived by his daughter, Carmen Graham Christgau, of San Francisco. A memorial gathering for Graham‘s friends and colleagues is scheduled from 3 to 4 p.m. on Dec. 4 at Phillips-Robinson Funeral Home, located at 2702 Gallatin Road.